We’d love your help. Let us know what’s wrong with this preview of Peep on a Perch by Andrea Posner-Sanchez. 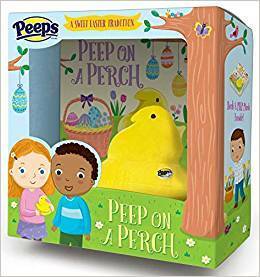 Start a new Easter tradition with Peep on a Perch--the PEEPS® plush and picturebook boxed set the whole family will love! Step aside, Elf--Peep on a Perch is the newest holiday tradition around! Peep on a Perch is a book and plush boxed set that makes the perfect Easter gift. The storybook, perfect for boys and girls ages 3 to 7, tells how the Easter Peep assists the Easter Start a new Easter tradition with Peep on a Perch--the PEEPS® plush and picturebook boxed set the whole family will love! To ask other readers questions about Peep on a Perch, please sign up. Peep on a Perch is a cute take on Elf on a Shelf and the book comes boxed with a plush yellow Peep. The book encourages children to help, share and be kind as the Peep reports directly to the Easter Bunny. The book hints that children who are good might get an extra treat or colored egg in their basket. Sophia took to this idea immediately, but also enjoying spotting the peep throughout the book. One page featuring the family at dinner didn't have the Peep perched anywhere and this was quite dis Peep on a Perch is a cute take on Elf on a Shelf and the book comes boxed with a plush yellow Peep. The book encourages children to help, share and be kind as the Peep reports directly to the Easter Bunny. The book hints that children who are good might get an extra treat or colored egg in their basket. Sophia took to this idea immediately, but also enjoying spotting the peep throughout the book. One page featuring the family at dinner didn't have the Peep perched anywhere and this was quite distressing. We've read the story several times, and while we haven't done anything to encourage that the Peep is watching, she has taken to doing random chores within its sight. The pages are beautifully illustrated and feature the Peep logo prominently. All in all, this was a cute Easter book. Peep on Perch finally answers the age old question of where do all these peeps come from. I don't know about you but I tend to have tons of peeps lying around my house. Now I know they are spies from the Easter Bunny. They are just checking to make sure you are being good. But if you are not that is okay too because you will get something it just won't be as good. As a huge fan of peeps I enjoyed this book.